Riding the school bus to summer camp can be a fun and exciting experience for kids who are getting their first taste of independence by making their own way to school. It can also be a dangerous situation for little ones that aren’t aware of the proper safety rules governing school bus transportation. During the school year, children are more cognitive of the school bus rules and they must be reminded that the school bus used for day summer camp, even when strange bus driver appears, has the ‘same rules for safety‘ – that no nonsense is required. Before walking your youngster down to the bus stop for that first big day of getting to summer day camp without being driven by a parent, make sure that she understands these ten safety rules. 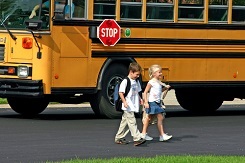 Walk On the Sidewalk – Kids should know never to walk in the street to get to their bus stop, only on the sidewalks. Your child should also have a solid understanding of how to properly cross the street on the way to and from the bus stop if he’ll be crossing along the way. Get to the Bus Stop Early – When kids are late for the bus, they’re more likely to run and be careless, which could easily result in messy falls and scrapes. Make sure that your child also understands how dangerous it is to chase after a bus that they’ve missed. Wait for the Bus in a Safe Place – If there’s no designated bus stop with seats and shelter for the school bus in your neighborhood, make sure that your child understands how to wait for the bus in a safe place. That means at a manageable distance from the street so that he’s not hit by a driver that can’t see him. Don’t Speak to Strangers at the Bus Stop – While it’s smart for kids to get to the bus about five minutes early, it’s also important that your child understands that getting there too early and waiting alone can make him a target for strangers. Encourage kids not to talk to strangers and to communicate to you or another trusted adult if someone is making them feel uncomfortable. Stay in Your Seat – Kids are naturally rambunctious and energetic, but your child needs to understand that getting out of his seat can leave him injured in the event of an accident. If he’s out of his seat to roughhouse with another rider, that distraction to the driver can even contribute to an accident. Don’t Litter – Throwing things out of the windows of a school bus isn’t just littering, it’s also unsafe behavior. Flying objects can pose a distraction or danger for other drivers, so having a discussion about the implications of throwing things out of a bus window is a wise idea. No Pushing – The steps leading from the ground to the floor level of the bus tend to be quite steep, and aren’t always easy for little legs to manage. Pushing a fellow rider can cause her to fall, putting her in danger of falling out of the driver’s line of sight and under the bus. Look for the Driver’s Signal Before Crossing the Street – Most drivers, especially those that are in charge of very young riders, will signal to their pint-sized passengers when it’s safe to cross the street. Find out if your child’s driver will be giving her such a signal, then make sure that she knows to watch for it before crossing. Cross Carefully – Kids should always cross the street after getting off the bus from the front, never the back. It’s also difficult for a driver to see a child that’s crossing less than ten feet from the front, so work with your child to help him learn the proper distance away from the school bus he should be when crossing the street to prevent accidentally being run over. Go Straight Home From the Bus Stop – If your child is old enough to look after himself after getting off of the bus, make sure that he knows how important it is to go straight home and let someone know that he’s arrived safely. If he’s going home to a parent or caregiver, he should still go straight home to make sure that they’re aware of his arrival. Talking to your child about the importance of checking in before going to a friend’s house or anywhere else in the neighborhood is imperative, especially for new bus riders. Failure to heed many of these rules is likely to be a direct violation of the bus rules, which can often lead to suspension of riding privileges and other negative consequences. Talk to your child about how easily he can be suspended or expelled from the bus if he fails to follow the rules to impress upon him the importance of following directions.